I had the honor of dancing with the LIGHT MOTION and WHISTLE STOP dance companies at the Seattle Art Museum sculpture garden (2009) and the Experience Music Project (2014). In 2011 I performed at Z space in San Francisco with Sins Invalid. Read a review of this event here. This is a clip from a dance piece I performed and choreographed with Lori Lawrence titled “Knot Bound”. This piece was filmed in Olympia, WA at the Capitol Theatre (2007). I started doing stage makeup for myself when I was a drag performer in the 1990s. I drew inspiration from drag icons, glam rock and punk. I was self-taught and it was because of my drag makeup that I have since been asked to do makeup design for various large scale productions. In 2009 I was the make up artist for Sins Invalid’s performance event in San Francisco, CA at the Brava Theatre. 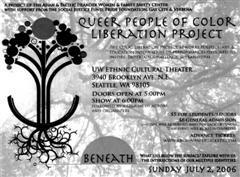 I was the makeup artist for the first two productions of Seattle, WA’s Queer People of Color Liberation Project. I was proud to create original makeup designs for the rock opera “The Transfused”, performed in Olympia, WA. The makeup for this show required multiple custom-molded prosthetic facial pieces, hair pieces, and body painting.